Quality UHF RFID device The RH768 offers users a high reading performance in terms of accuracy, flexibility and distance. Read RFID tags up to 4.2M (depending on frequency and application) requiring no line-of-sight between the reader and the tag. 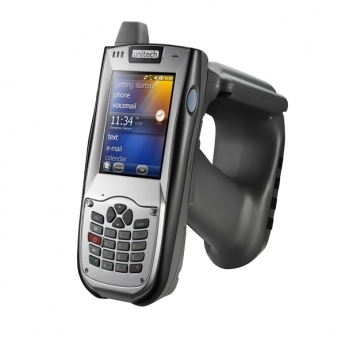 Unitech RH768 Rugged Industrial UHF RFID PDA mobile computer - Because barcodes and RFID tags are frequently being used side by side the RH768 features a 1D barcode reader next to a RFID reader for great user flexibility. As all Unitech devices the RH768 belongs to the category: rugged. A 1.2m drop spec and IP54 rating against moisture and dust provides the resistance which is needed in industrial surroundings like warehouses. High easy-handling level Being a well-balanced RFID reader, the RH768 offers a very high easy-handling level. The main weight of the device is ergonomically spread over the complete device, which makes it far more convenient than other RFID readers. The gun grip of the RH768 contains a second battery to secure double operation time, up to 12 hours. With the RH768 you can scan RFID tags for accurate stock control, asset management or replenishment whole day long and increase the satisfaction of your customer as well as of your employees. Global usage Using RFID technology you can track and trace your goods within the supply chain easily, even if this process concerns various countries. Next to the integration of all latest communication technology, 802.11 b/g (CCX4), Bluetooth 2.1 + EDR, 3,5G and GPS, this device can be used globally. The RH768 supports multiple regional bands (US, EU and JP) in one device, offering the possibility to switch frequencies according local laws without the need of another device. Get in control of your business processes and costs!